If you are looking for information on the Sandella's franchise business opportunity, Sandella's Cafe franchises or Sandella's Flatbread Cafe franchising, then you have come to the right place. 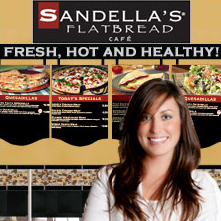 Sandella's is the largest and fastest growing flatbread concept in the World! With over 125 restaurant locations open and over 300 more in development, Sandella's Flatbread is the hottest franchise opportunity in the fast casual segment! 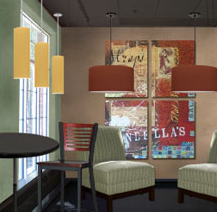 Learn why Fast Casual Magazine named Sandella's to it's 2007 Top Movers & Shakers List. The Sandella's Flatbread franchise opportunity offers a low cost of entry, premium products with high demand, great looking stores and simple systems. Founded in 1994 in West Redding Connecticut, Sandella's Flatbread is an upscale, fast casual Café. Our menu features premium quality, health-conscious and delicious products, all served on Sandella's proprietary brick oven flatbread. Our menu appeals to a broad demographic, and includes our signature grilled flatbreads, sandwiches, paninis, quesadillas, & salads. It's all about the taste and the experience - premium products, in a warm and upscale fast casual setting! Sandella's Flatbread - Hot & Healthy Products with Mass Appeal! USA Today announced the rising popularity of flatbread in a March 2007 article, saying "Flatbread is emerging as the hottest thing since sliced bread." Sandella's is ahead of the curve! We have perfected our very own distinctive, high quality, 3-layer brick oven flatbread recipe over the past 13 years. Sandella's flatbread is prepared using only the finest ingredients available. It is all-natural, and does not contain any artificial flavors or colors. Our flatbread is the perfect complement to a healthy diet, as it is trans-fat free, low fat, low calorie and kosher. And most importantly, simply delicious! Sandella's is a member of the International Franchise Association. 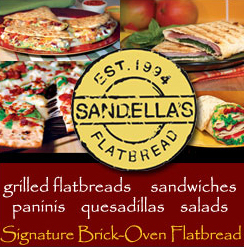 Sandella's Flatbread is also approved by the SBA Franchise Registry. The SBA Franchise Registry has streamlined eligibility guidelines and operating procedures that will reduce costs and processing time, making the SBA loan application process as fast and easy as possible. Proven concept in 125+ locations! Healthy menu items: no trans fat on menu, listed in Weight Watchers points guide, and flatbread is kosher and low fat! Q: What size is a prototypical Sandella's? A: The traditional Sandella's prototype is 1,000-1,500 sq. ft. and our non-traditional format is 500-700 sq. ft.
A: Yes. Sandella's has a full real estate system to help you with market analysis, site analysis, lease negotiations, and other tools to help you secure high potential locations. Q: Who is your customer target? A: Sandella's tends to appeal slightly more to women but in general our target customers are young couples, young families and young singles ages 25-45, that are health conscious, college educated, with household incomes of $50,000+, that lead busy lives, are concerned about health, and are familiar with new sophisticated tastes.